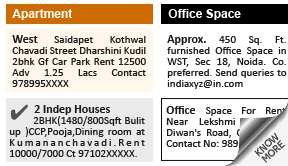 Why place To Rent Ad in Sikkim Express Newspaper ? You get to book your ads online in a simple process that takes less than 10 minutes of your time. You can avail of up to 7 different online and offline payment options to pay your advertising bill. 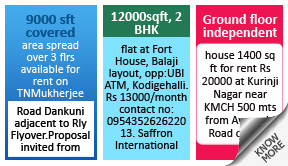 When someone is interested in subletting property to tenants, the simplest way to achieve that goal at the earliest is by publishing a ‘To Rent’ ad on Sikkim Express newspaper. These ads contain several details about the property, such as the address, the area in square meters, and any significant landmark to identify the property, followed by the lessee’s preferred use of the property, viz office space, banquet hall, residence, etc. • 2BHKflat, 1 Store, 2 Balcony in township with gymnasium & pool facility in Zirakpur. Service family please contact - (11-4PM), commission agents please excuse . • 3BHK Flat for Bank/Company lease at Halwasiya Enclave, Opp HAL Gate,Indiranagar,Lucknow, Mob- 9051473420. How To Book To Rent Ad in Sikkim Express Newspaper ? Now view rates, book your ads & clear payment for all your to rent ads in Sikkim Express over the internet! View advertising rates of different cities where you can advertise in Sikkim Express from the list above. Compose your ads online. You can seek the help of our online ads gallery to efficiently compose your ad. Select advertising date(s) and clear payment. You can book your ads on Sikkim Express by viewing rates and selecting your location from the panel above. If you wish to know more about releaseMyAd, click on the relevant tabs.